A fabulous design that looks good under blouses and on its own with collarless tops! Twisting corkscrew tubes of sterling silver alternate with 6mm sterling silver rounds and black onyx. Adjustable from choker length of 14½" to necklace at 18"
Necklace set includes matching bracelet and free matching earrings. 17-1/2" rose quartz necklace. Features a lampwork (glass) bead with flower design encased in clear glass, with a lilac core and green ribbon accents--by Desert Bloom. 4mm rose quartz alternates with pewter beads in antique gold finish. Toggle clasp is gold vermeil. SOLD! 39" lariat -- a string of alternating 4mm black onyx and Crystal Swarovski bicones with AB coating for extra flash. Finished with 8mm round Swarovski crystals. A great basic for evening wear! May be custom ordered. Ring your ankle with a gorgeous bracelet of antique gold finished pewter and mahogany obsidian! Based on my popular Mahogany and Gold necklace, this ankle bracelet is a similar set up, adjustable from 9 to 11". The gold tone extender chain is finished with a small Swarovski crystal at the end that swings provocatively as you walk. May be custom ordered. Genuine apple coral necklace featuring a variety of apple coral beads in oval, round, and heishi. Very hard to find genuine apple coral anymore, especially featured in a necklace like this! The main bead sizes range from 10mm for the round apple coral beads to 21mm for the bead at the center. 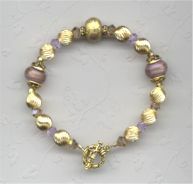 Bronze colored glass beads and antique gold pewter add a splash of class throughout. Necklace length is 16" and is intended to fall just below the base of the throat. A definite eye catcher! May be custom ordered. Remember to check out the [Gallery] for more completed projects.